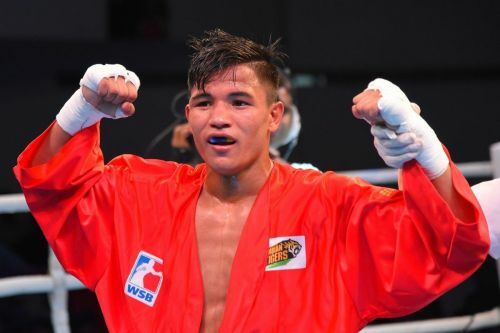 New Delhi, Jun 22 (PTI) Debutant Vanhlimpuia (75kg) and Etash Khan (56kg) advanced to the semifinals to assure themselves of medals at the Ulaanbaatar Cup boxing tournament in Mongolia today. However, the experienced L Sarita Devi (60kg) lost a closely-contested quarterfinal bout to Chinese Taipei's Shih Yu Wu to go out of the tournament. Vanhlimpuia, competing in his maiden international tournament, defeated Korea's Song Myong Su in a unanimous verdict, producing a power-packed performance. Etash, on the other hand, had to slog it out a bit against China's Jia Wei Lu before fetching a split verdict in his favour from the judges. India were earlier assured of four more medals when the world and Asian silver-winner Sonia Lather (57kg), Lovlina Borgohain (69kg), Himanshu Sharma (49kg) and Ashish (64kg) advanced to the semifinals.